Madison, WI (April 8, 2015) ­ On Tuesday, April 7th, three communities voted in favor of amending the U.S. Constitution to make clear that money is not speech and that only real people should have inalienable Constitutional rights. This would reverse the Supreme Court’s Citizens United decision, which opened the floodgates to big money in elections. All of the referenda passed with striking majorities: Watertown (69%), Evansville (80%), and the Town of Reedsburg (63%). This brings the total number of Wisconsin communities that have called for an amendment to 57. In total, over 2.4 million people (41% of Wisconsinites) live in these jurisdictions. Across the country, 16 state legislatures have voted for an amendment, as well as over 650 towns, villages, cities and other organizations. Polls have shown widespread disapproval of Citizens United across the political spectrum. According to an August 2014 poll, more than three quarters (78%) of voters feel that reducing the influence of money in politics is an important issue. 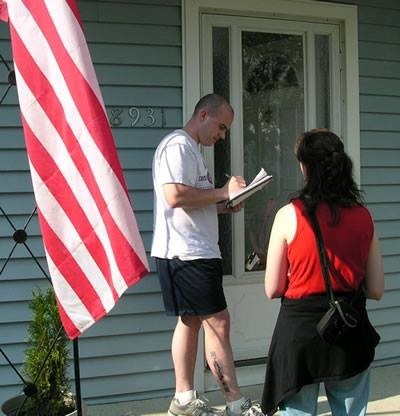 “When will the legislators in Madison listen to the people of Wisconsin?” said Bill Waser, leader of the petition drive in the Town of Reedsburg. “I spent over 10 years in our Navy and never once did I hear at morning muster “AT&T, GM, or Walmart. How can you say that a corporation, union, or other nonprofit organization is a person? Sure, made up of people, but so is a city… is a city a person? It’s ridiculous. 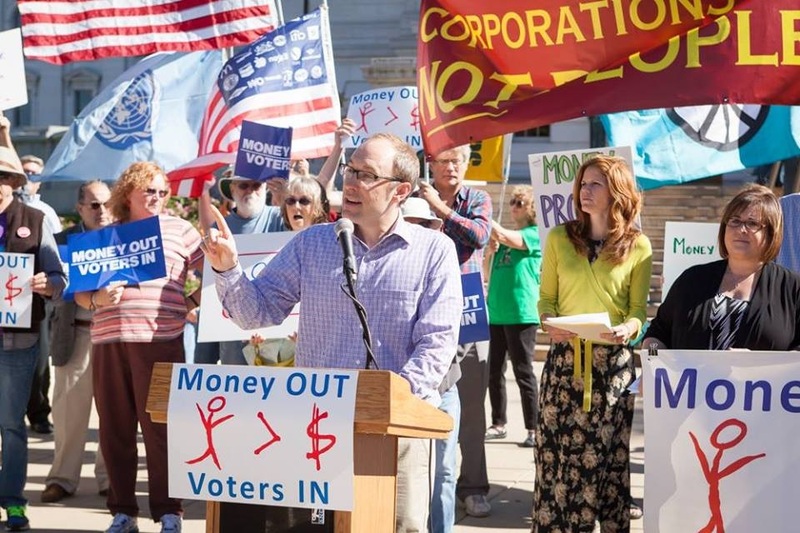 To mark the 5th anniversary of the Supreme Court’s highly controversial 2010 Citizens United decision, Money Out, Voters In Wisconsin (MOVI) is holding a press conference at 9:00am in the Assembly Parlor Room, at the Wisconsin State Capitol. Following the press conference, MOVI supporters plan to meet with representatives at the Capitol. Five years ago today, the Supreme Court issued the highly controversial 2010 Citizens United v. Federal Election Commission decision. A split Supreme Court—with 5 justices supporting and 4 justices opposing—decided that corporations, unions and other similar entities have the same rights as those reserved for citizens, and therefore, in protection of their First Amendment free speech rights, these corporate entities can contribute unlimited funds to elections. Over the past five years, what have been the consequences of this controversial and far-reaching Supreme Court decision? Each election cycle since the 2010 Citizens United decision has seen more and more money pouring into the system. Campaigns have become significantly more costly, and perhaps even more significant, in recent elections the candidate with most money has won over 90% of the time. Most of the money in these ever more expensive elections comes from big corporate special interest, who have vastly outpaced the contributions of small donors. In 2014, the Supreme Court further undermined the ability to regulate campaign contributions in the McCutcheon v. FEC case. This ruling struck down aggregate limits on campaign contributions to federal candidates and political committees, making it easier for corporate groups and the super wealthy to contribute large sums directly to candidates and political parties. According to a 2012 Brennan Center for Justice poll, nearly 70% of Americans believed superPAC spending leads to corruption, and 85% believed that, compared with past elections, the money being spent by political groups in elections was more likely to lead to corruption. Thus, it appears more and more money is pouring into elections and the majority of people believe that all this money is leading to widespread corruption. The extension of constitutional rights to corporations, unions and other similar entities, often known as “corporate personhood,” has led to other serious issues. Corporations have used their court granted constitutional rights to evade protective regulations and to shun societal obligations. For example, in an effort to avoid environmental protections, the courts have claimed that regulatory inspections violate their Fourth Amendment protections from illegal search and seizures. Corporations have even claimed the First Amendment right to religious freedom, as seen in the 2014 Hobby Lobby case. In this case, a corporation successfully claimed the first amendment right of religious freedom to avoid complying with a government mandate. With the significant consequences of the Citizens United decision in mind, there is a movement afoot to amend the constitution, to reign in political spending and to end corporate personhood. Nationally, the Move to Amend group is working state-by-state, town-by-town, and ultimately person-by-person to overturn Citizens United by amending the U.S. Constitution. Move to Amend is a national coalition, with more than150 local affiliates and over 370,000 members. Move to Amend supports the We the People Amendment, which clarifies for the Supreme Court and all Americans that money is not speech, and therefore, campaign spending can be regulated; and only human beings—not corporations, unions, and the rest—are entitled to constitutional rights. Thus far, 16 state legislatures have signaled their support in favor of some type of constitutional amendment to overturn the Citizens United decision. 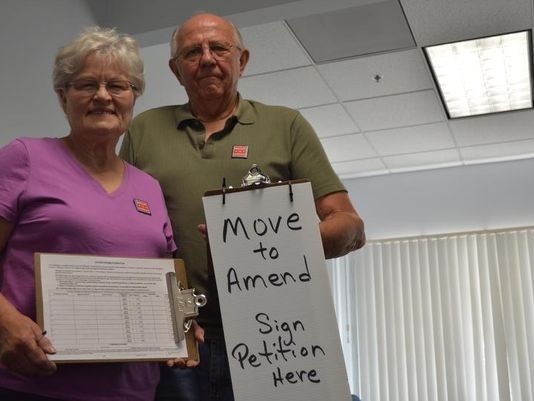 Across the country, almost 600 cities, towns, villages, and other organizations have voted in favor of the Move to Amend amendment, often by an overwhelming margin. In Wisconsin’s last election, twelve communities voted in support of an amendment, with every measure garnering at least 70% support. To date, 54 Wisconsin communities that have called for the Move to Amend amendment. In total, 2.4 million people (41% of Wisconsinites) live in these jurisdictions. Unhappy 5th Birthday, Citizens United! The 5th anniversary of the disastrous Citizens United decision is this Wednesday, January 21st. United To Amend and Money Out, Voters In Wisconsin has a full day of events planned. Please Join Us!! 8:45 AM – Lobby Day Activist Training @ WISPIRG, 122 State Street, 5th Floor, Madison (map). 9:00 AM – Press Conference – Assembly Gallery Room, Wisconsin State Capitol Building, Madison. 10:45 AM – 2:00 PM: Lobby Day at the Capitol. 2:00-2:30 PM – Debrief, Capitol Routunda. 3:00 PM – Post-Lobbying social hour (Location TBD). 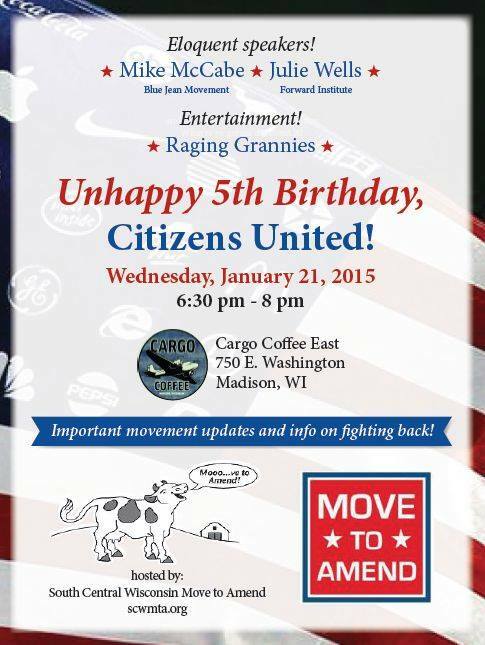 6:30-8:00PM – Unhappy 5th Birthday Party, Citizens United with Mike McCabe, Julie Wells, Kaja Rebane and the Raging Grannies! Meet us at Cargo Coffee, 750 E. Washington Ave, Madison (map). 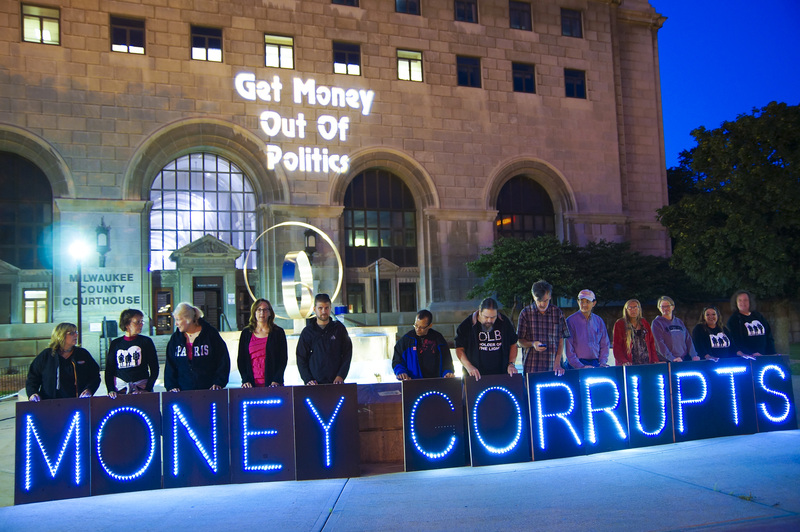 Madison, WI (November 5, 2014) – On Tuesday, November 4th, twelve communities voted in favor of amending the U.S. Constitution to make clear that money is not speech and that only real people should have inalienable Constitutional rights. This would reverse the Supreme Court’s Citizens United decision, which opened the floodgates to big money in elections. All twelve referenda passed with overwhelming majorities: Milwaukee County (70%), Dunn County (72%), Green Bay (77%), Appleton (74%), Fond du Lac (73%), Neenah (79%), Menasha (80%), Ripon (79%), Oregon (79%), Stoughton (82%), Wausau (77%), and the Village of Park Ridge (83%). This brings the total number of Wisconsin communities that have called for an amendment to 54. In total, 2.4 million people (41% of Wisconsinites) live in these jurisdictions. Across the country, 16 state legislatures have voted for an amendment, as well as almost 600 towns, villages, cities and other organizations. 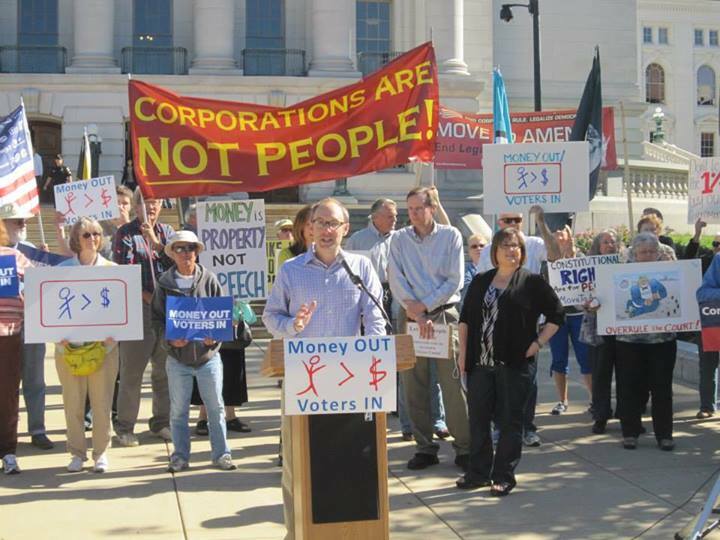 Madison, WI (October 27, 2014) – On Tuesday, November 4th, Wisconsin residents in twelve communities will vote on whether to amend the U.S. Constitution to make clear that: a corporation is not a person, and money is not speech. Voters will cast ballots in Milwaukee County, Dunn County, Green Bay, Appleton, Fond du Lac, Neenah, Menasha, Ripon, Stoughton, Oregon, Wausau and the Village of Park Ridge. If all vote in favor, this will bring to 54 the number of Wisconsin communities that have called for an amendment. Nationwide, 16 state legislatures have done likewise, as have almost 600 towns, villages, cities, counties and organizations. The language of the proposed amendment would reverse Citizens United, the Supreme Court’s 2010 ruling. “The Supreme Court changed the meaning of the 1st Amendment, and we want it changed back,” said Mary Laan, the Move To Amend leader in Milwaukee County. The National 28th Amendment Roadshow is Coming to Madison! Never before in the history of the United States has our system been so openly corrupted by big money. Our democracy has been overtaken by monied interests who have bought favor with politicians, putting up huge roadblocks to any legislation that benefits average Americans. But all over the country people are fighting back and demanding change. Now is the time to take our government back! Over 80% of Americans support a constitutional amendment. 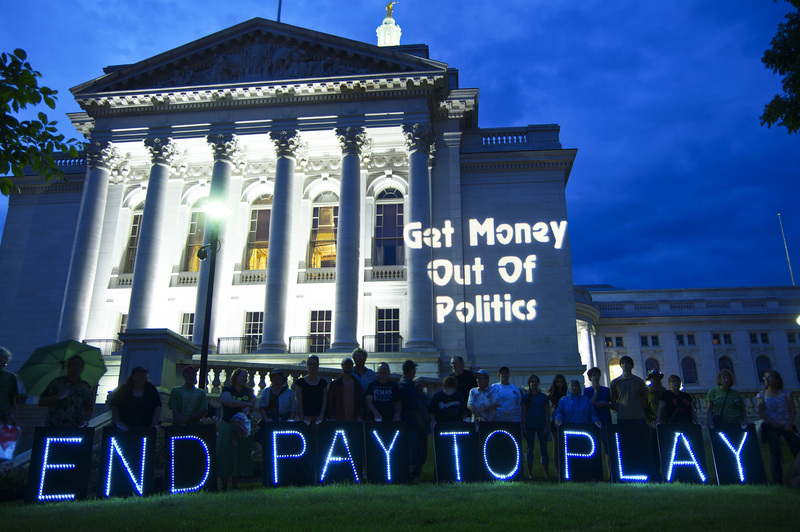 Over 140 groups are working to GET THE MONEY OUT of politics. 16 states and almost 600 cities have called for a constitutional amendment. The 113th Congress proposed 14 amendments. Please join us on Saturday, Sept 6, when the “28th Amendment National Roadshow” comes to the Marquee Theater at Union South on the UW Madison campus (map). 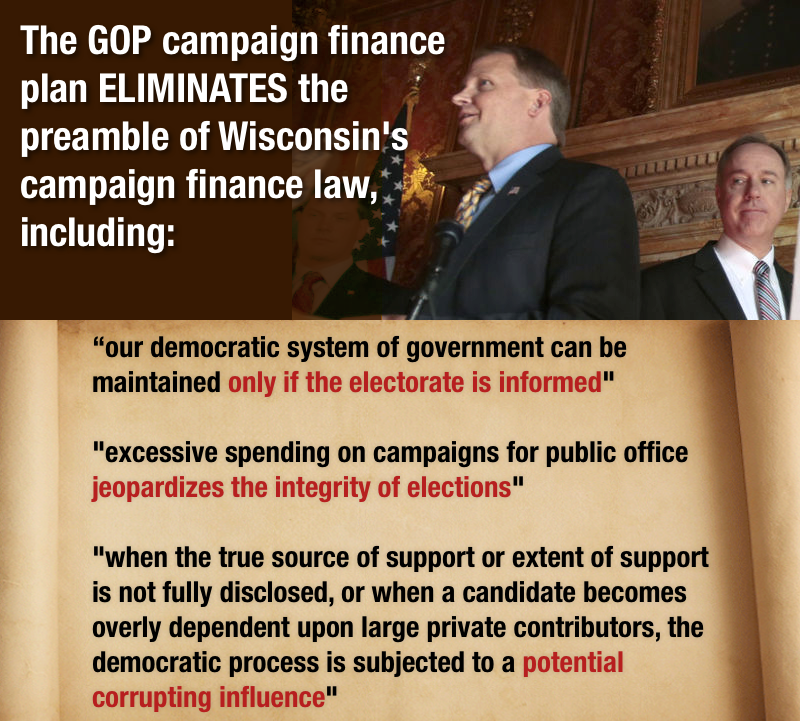 This event is being organized by the national Money Out, Voters In (MOVI) organization, in cooperation with the Wisconsin Money Out Voters In Coalition. At the roadshow, amendment movement leaders and money in politics experts will lead a discussion on the need for a constitutional amendment to abolish corporate personhood, end the notion that money is speech and discuss how we can move forward from here. A $5 donation is requested to participate in the conference. Click here to RSVP now! The “National Roadshow” is endorsed by Move To Amend and other groups that are working across the country to pass an amendment. The conference will be taking place Saturday, Sept 6 from 10AM-1PM, and includes a free screening of PAY 2 PLAY: DEMOCRACY’S HIGH STAKES at 2PM. The day is scheduled so that people can come for the morning session, the afternoon session, or for a full day. Click here for more information and to RSVP! This will be major event with a full day of speakers and opportunities to network amongst activists who care about this issue.